A sermon preached at St. Andrew's On-the-Sound Episcopal Church in Wilmington, NC on May 4, 2014. The texts were Acts 2:14a, 36-41 and Luke 24:13-35. “Peter, standing with the eleven, raised his voice and addressed the multitude: ‘Let the entire house of Israel know with certainty that God has made him both Lord and Messiah, this Jesus whom you crucified’.” The boldness of Peter continues to astound me. The man who had three times denied Jesus out of fear is now emerging as one of the most courageous and bold preachers following Jesus’ resurrection. His preaching is filled with the kind of certainty that came from those three years spent as a disciple of Jesus. His preaching is filled with the kind of certainty that came from seeing with his own eyes the Risen Jesus who came to them saying, “Peace be with you” while showing him the wounds still present in his body. Peter preached with certainty because he desired that those listening to him would know with the very same certainty that Jesus is both Lord and Messiah. Though some in the crowd may not have seen the Risen Jesus personally, a great many of them would have certainly had interactions with Jesus those three years he ministered in the Galilean countryside. Many would have seen him walking with his friends, perhaps laughing at a joke, or skipping rocks on the water. Perhaps some could remember the gate of his step, or the way his hair fell on his tunic. They may have seen him reach down and straighten out the legs of a cripple. Perhaps some were there when he called forth Lazarus from the tomb and raised him to walk in the newness of life. Though they may not have seen the Risen Jesus, they certainly would have seen Jesus before, touched him, and listened to him. There would have been no cause for doubt that he was real, that he truly had gone about doing God’s work in the towns they lived in. 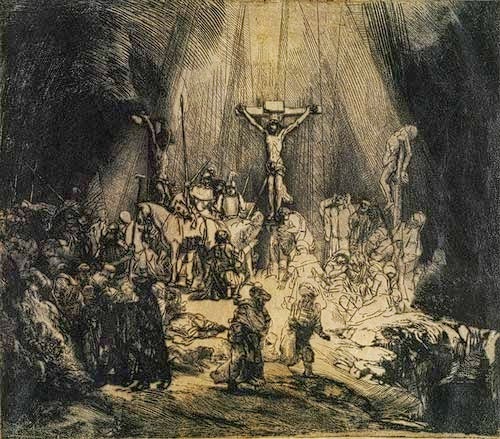 Certainty would not have been elusive for them, because they knew for certain that he was real, and had died on a cross, and they bore witness to the transformation of his disciples from cowering fishermen to courageous preachers on account of their experience of the Resurrection. But certainty may not be so easy for us to grasp in this day. How many of us have touched with our hands the rough and coarse tunic of Jesus? How many of us have seen with our eyes the Lord healing a blind beggar, or breaking fish and loaves for thousands? Did any of us hear him declare on that mountain, “Blessed are the peacemakers, for they will be called children of God?” Not discounting spiritual or mystical experiences, none of us can know Jesus with the same kind of certainty the disciples had because we are living 2000 years removed from the life, death, and resurrection of Jesus of Nazareth. Unlike those early Christians who had been taught by Peter and John, we are long removed from a physical, tangible remembrance of Jesus. We have inherited a story, a tradition that is passed down to us...a story that we will never be able to prove with the kinds of facts that one would find in a history book. We are those people who believe, yet have not seen. But even more than having a story, something else that we have, as fleeting as they often may seem, are experiences of Jesus that ‘cause our hearts to burn within us’, and call us to return time and time again to the place where we feel that burning. 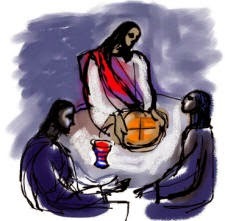 As it is in our Gospel today, that place is this table, where bread is taken, blessed, broken, and shared in the conviction that somehow, someway, Jesus is made truly present to us in this bread and wine. Of all the post-Resurrection appearances of Jesus, this story is most like ours. Many of us living in this age of uncertainty find it easy to question…to question where God is in the midst of a confusing world…to question the paths our lives seem to be taking, and why God isn’t any clearer in giving direction. Perhaps many of us even feel downcast or dejected as we come to church, questioning why we even bother coming week after week. 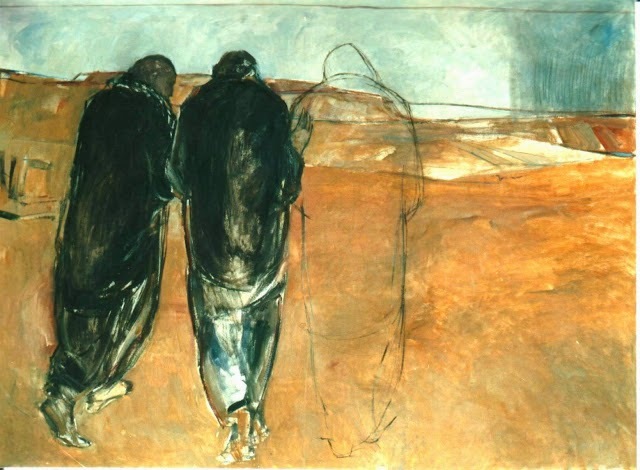 The disciples on the Road to Emmaus certainly knew what it means to question: “They were talking with each other about all these things that had happened. While they were talking and discussing, Jesus himself came near and went with them, but their eyes were kept from recognizing him. And he said to them, ‘What are you discussing with each other while you walk along?’ They stood still, looking sad.” Recalling all that they had seen and borne witness to, even mentioning the rumors that Jesus has been resurrected, they still felt sad. Perhaps it was this sadness that kept them from discerning that Jesus was in their midst. Who knows? The deeper truth is that they were in the midst of the greatest crisis of their lives, walking away from Jerusalem, walking away from the community they had found, a community now shattered by death, or so they thought. But as they were walking away, with the hidden Jesus still present in their midst, something within them began to stir. They recounted their story to this Mysterious Stranger, but the story suddenly took on a new and greater significance as Jesus himself began to interpret to them all of these signs and prophetic words…he began to interpret these events which, perhaps, allowed them to glimpse a new significance to their own story as they became illuminated. Quite profoundly, their story became even more significant when interpreted through the lens of the Messiah's story. A familiar story, given new meaning, became so compelling to them that they didn’t want to lose the company of this Mysterious Stranger: “They urged him strongly, saying, ‘Stay with us, because it is almost evening and the day is now nearly over’.” The Stranger agreed, and they rested together. But even though he was their guest, resting with them at their invitation, suddenly he assumed the role of the Host. They invited him, but he set for them a table and gave them a feast. He took the bread, blessed and broke it, and gave it to them. And at that moment their eyes were opened, and they recognized him. But suddenly he was gone, vanished, nowhere to be found, no chance to cling to him, no chance to say goodbye. Gone. And they said to each other that famous and beautiful phrase, “Were not our hearts burning within us while he was talking to us on the road, while he was opening the Scriptures to us?” Suddenly, their life granted new meaning, their hearts set ablaze, they returned to Jerusalem to share this news, how Jesus had been known to them in the breaking of the bread. Jesus was known to them in the breaking of the bread. We may not have the experience of walking with a Mysterious Stranger and breaking bread with him, only to have him vanish. But we do have the experience of coming together week after week, clinging to the same experience these disciples had: our lives granted new meaning and significance by the hearing of the Scriptures and the breaking of the bread. Take a moment to reflect on what it is that draws you to this church, week after week. Everyone’s reflection is bound to be different, but perhaps we have all had a bit of this ‘burning heart’ experience, in big or small ways. This table, this altar, is a place where our lives are taken up and given new significance. Where once we were disparate and conflicted individuals, together at this feast we are called ‘children of God’, ‘living members of Jesus Christ’. Where hatred and division abound outside, this table is a place where, on the best of days, everyone lays aside their grudges, fears, frustrations, and hatreds to receive the gift of the Eucharist. We may not have such a ‘burning heart’ experience every Sunday, and perhaps they come only a few times in our lives. 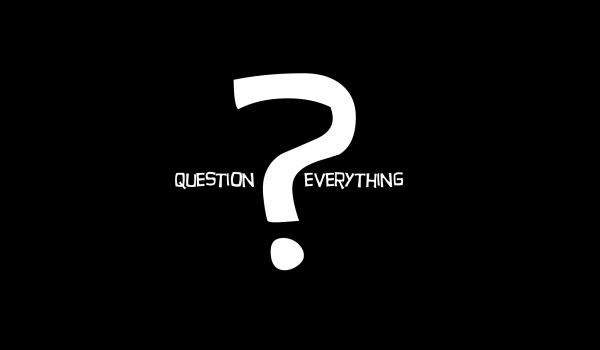 Questions may remain, and confusion may still be a constant companion on this journey of faith. That’s part of the cost of finding ourselves in this 2000 year old story. But look around you. See the faces of both friends and strangers, people from all walks of life, people gathered into one body, people whose lives have been transformed by encountering the Risen Jesus in these simple gifts of bread and wine. 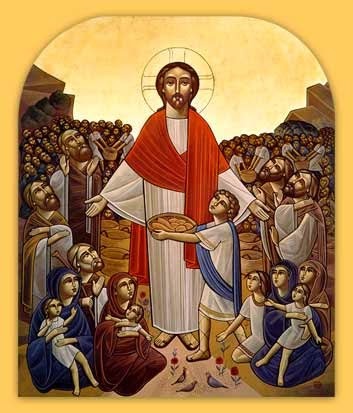 People who are transformed into living lives of service, selflessness, a self-giving rooted in their experience of a heart set ablaze by encountering Jesus, as fleeting as that encounter may be, in these simple gifts of bread and wine. Perhaps there really is something to this great mystery that we have received by faith, not by sight.